"Shout It Out Loud," KISS fans! The Spaceman, straight from the Destroyer album era! Authentically detailed costume and makeup, plus 11 points of articulation. Featuring all new head-to-toe sculpt! Ball-jointed shoulders enable him to hold his guitar! It's time to "Shout It Out Loud" as the band comes together in these excellently detailed 3 3/4-inch scale action figures modeled after the outfits worn on their iconic 1976 Destroyer tour. 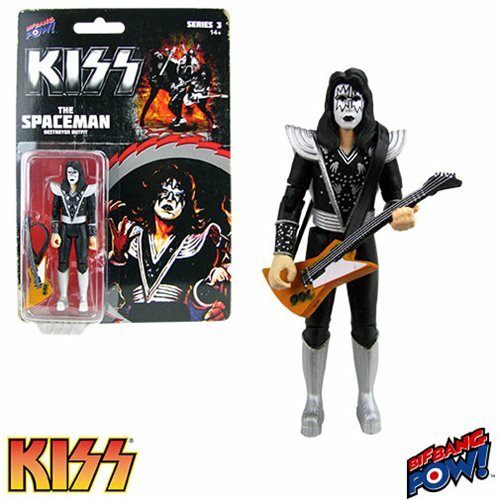 This KISS Destroyer The Spaceman 3 3/4-Inch Action Figure from Bif Bang Pow! presents Ace Frehley as The Spaceman, with an all new sculpted head and costume. 11 points of articulation (neck, shoulders, biceps, elbows, hips, and knees) allow for excellent poseability. The ball joints in his shoulders enable him to hold the included guitar. Other KISS figures sold separately - collect them all! Ages 14 and up.